A desperate plea for sanity from a crazy guy on a radio tower. That the last words of the great man didn’t amount to much doesn’t mean the film was crappy, or making things up as it went along. The lack of real resolution from the final revelation is as much a part of the story as anything. It demonstrates how no man can be understood fully from some piece of trivia. No one word can sum up a man’s life. Any life lived will be too vast for any such summation. Because that is indeed the origin of Shonen Bat, the secret behind Maromi, the whole hellish ordeal unleashed by Tsukiko’s psyche: she was afraid to tell her dad she’d let her new puppy get hit by a car, so she pretended they were attacked. First, though, let’s take the episode as it comes: beginning in the 2d world that Ikari has made for himself. Tsukiko has come in there, too, and as they go through town, living peacefully, people keep calling her little girl. They mistake the old detective for her father. It isn’t long before she becomes a little girl, wearing pigtails and walking her little puppy again. But Ikari is haunted by visions of his wife. Visions of her dying, and of her as a young woman. He comes to realize that he has done just what he admonished her not to – he’s escaped into a fantasy, leaving the real world behind. Maniwa, still nuts and still fighting Shonen Bat, demands Ikari come back to the real world through a television broadcast. At the same time all this is happening, a great black mass (made up, it seems, of all the Maromi merchandise that ever existed) sweeps through Tokyo, tearing through buildings and crushing everyone in its path. The great void in people’s hearts left by Maromi is being filled by the Shonen Bat sludge, which indiscriminately takes everyone. We see many of the characters we’ve followed through the series being swallowed up and smashed by the thing without a moment’s hesitation. No redemption, no reasoning. Death, death, death. When Ikari finally breaks from his fantasy (too late to ever see his wife again) he’s found by Maniwa, who confronts Tsukiko with the truth – not only did she invent Shonen Bat, but the Maromi doll and Shonen Bat are one and the same – evasions from her responsibility. The scene where he confronts her (and Tsukiko eventually breaks down) is interesting on a number of levels. Maniwa reveals what Tsukiko never understood – that her father knew she was lying, but played along because he blamed himself for the lie. 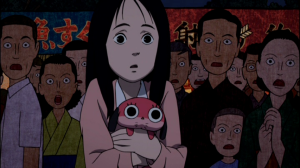 Tsukiko was so afraid of being punished that she had to invent an attacker to take the blame, an attacker that then become inextricably linked with the beloved dog in Tsukiko’s mind – so much so that when the dog becomes inexplicably popular, the attacker comes to life with it. some horrible, dark secret, but just a moment of personal mediocrity, based on a girl not understanding her father’s love – not getting how connected they were. It is part of what made Satoshi Kon a superior artist. He did not get so lost in his complexity (visually and otherwise) that he forgets, like so much anime does, the human heart. 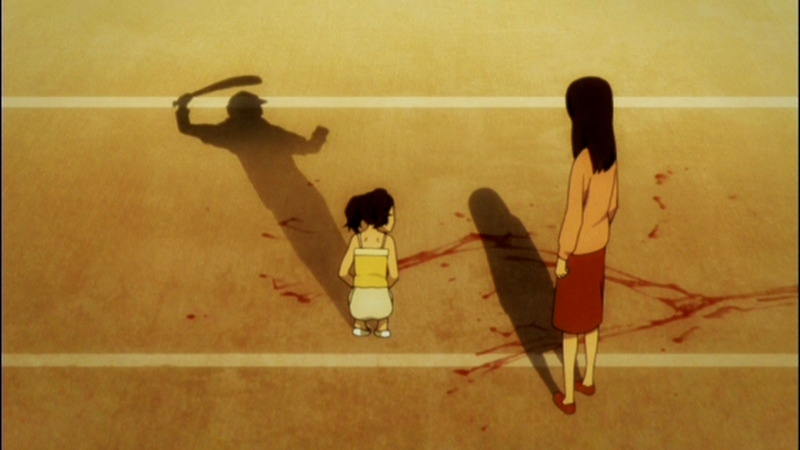 Of all the fantastic images the show creates, one of the most memorable, and touching, is not even seen – it is described: Tsukiko’s father, heart-broken over his daughter having to lie to him, patrolling the streets, carrying a bat, looking for the phantom attacker that hurt his daughter and killed her dog that he knows does not exist. A message of love she never understood. Cut to Tokyo rebuilt. 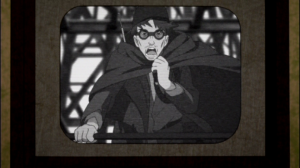 The ending sequences are parallel to the opening of the first episode, people packed into trains, never looking at each other. Maromi is, of course, out. There’s a new cat doll everybody loves. Ikari is still doing security, but now he has no wife to go home to. Tsukiko is seen briefly wearing a uniform (I think she’s a stewardess) with her hair cropped short. The last shot before the credits is Manami, body frail, hair prematurely white, sketching out his equations on the pavement. What do they mean? 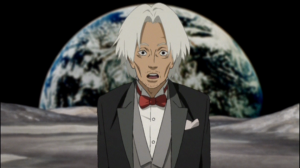 The next episode preview has been, throughout the series, a cryptic prophecy from the old man. Maniwa takes his place, and lets us know the cycle will come around, again and again. There will be new scapegoats and new atrocities, because people will continue to fail. They’ll fail to trust, fail to be competent. Shonen Bat disappears when the adult Tsukiko picks up the car-splattered, still bleeding corpse of her long lost puppy, and tells it she’s sorry. It’s a moment that would have been saccharine in another series. There would have been hugging and learning, and we would have seen a guarantee from the heroine that she will move on to bigger, better things. Ganbatte! Kaizen! But some mistakes can’t be fixed, and even Tsukiko’s last-minute redemption is too little. 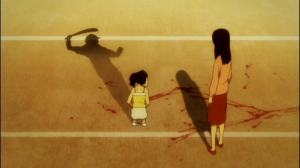 Paranoia Agent is dark and strange, but the darkness and strangeness is unusually mature and adult for anime, where dark twists generally involve a good guy suddenly becoming a cackling villain. The darkness comes from psychological ineptitude, the difference between self-image and the true personality. Meek, quiet little resigned Tsukiko is filled with enough undirected, unwarranted rage it kills most of the city. 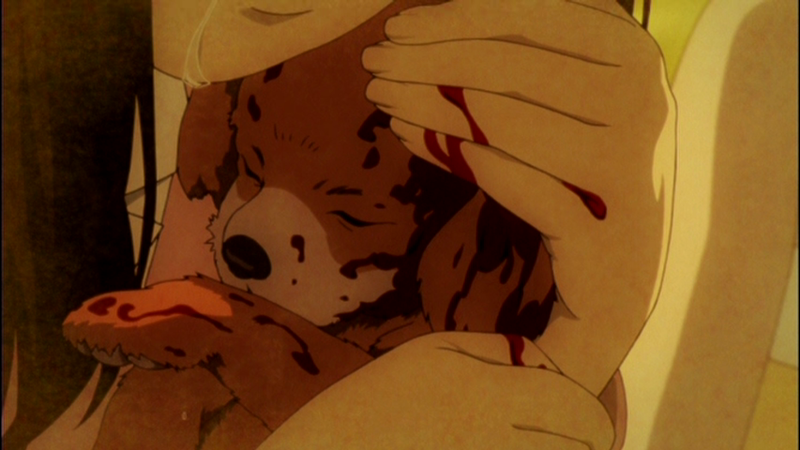 Ikari’s last words to his wife are an admonishment to live in the real world, eschew fantasy, but he never comes home because he’s deposited in his ideal 2d world, where everything makes sense, and he has the child he always wanted. Maniwa never gave up on his investigation, learned more than anyone else. He cracked the case, and so the case cracked him. At its heart, Paranoia Agent is about the absence of love, and of trust in love. It is not about this in a direct way – Dumbledore does not tell us straight out that the magic of love is what protects us from pseudo-Latin atrocities. But one by one, Shonen Bat’s victims succumb to a love of a self that doesn’t exist. This false self-image, false love, leads them to ruin – and in almost every case, there was someone for the victim, if they could only look outside themselves long enough to see it. Instead they demand something come and fix their problems for them. And someone does, with a bat. Berlin Alexanderplatz – II. How is One to Live if One Doesn’t Want to Die?